Islamabad, Pakistan - Top diplomats from the U.S., Pakistan and Afghanistan claim to be gaining ground with plans to reach a peace deal with the Afghan Taliban, but revealed little about their progress. The trio of diplomats met here in the federal capital on Tuesday for the fourth meeting of the so-called Corp Group, established to map out a political settlement between Kabul and the Afghan Taliban, a strategy Washington now supports. U.S. officials originally said Raymond Davis was a diplomat, but later revealed he is a CIA contractor. 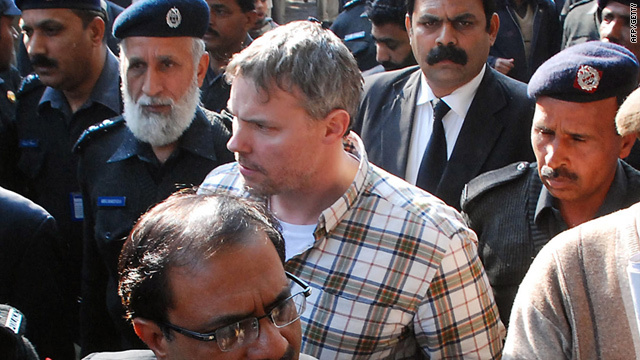 Raymond Davis, the American accused of killing two Pakistani men, appeared in a Pakistani court Friday where he was handed documents that detailed the case against him. The court then adjourned until March 3 when Davis is expected to be formally charged. The case has strained relations between the United States and Pakistan, a key ally in the war against al Qaeda and the Taliban in neighboring Afghanistan, and many Pakistanis are outraged by the incident. 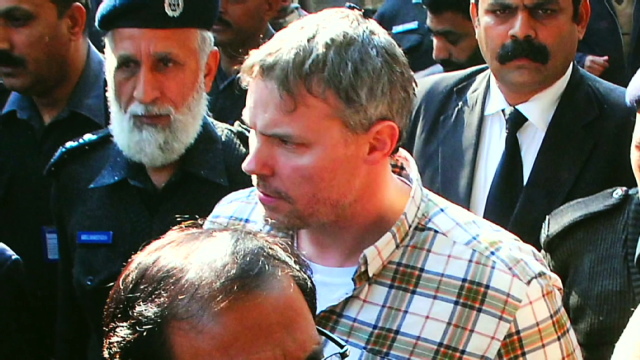 Davis has said that the shooting occurred after he was attacked by two men as he drove through a busy Lahore neighborhood on January 27, according to the U.S. Embassy in Pakistan. Islamabad, Pakistan (CNN) - Militants in northwest Pakistan shot and killed four men they accused of spying for the United States, police told CNN. In three separate attacks, militants on motorcycles torched trucks in Pakistan on Friday that were taking fuel and supplies to NATO troops in Afghanistan, police said. seven districts of Pakistan's volatile tribal region bordering Afghanistan. speak to the media on the record. Qaeda-linked groups fueling the insurgency in Afghanistan. strike was the 93rd this year, compared with 52 strikes in all of 2009. The death toll from a suicide car bomb attack on a police facility in Pakistan's largest city has risen to 17, police said. 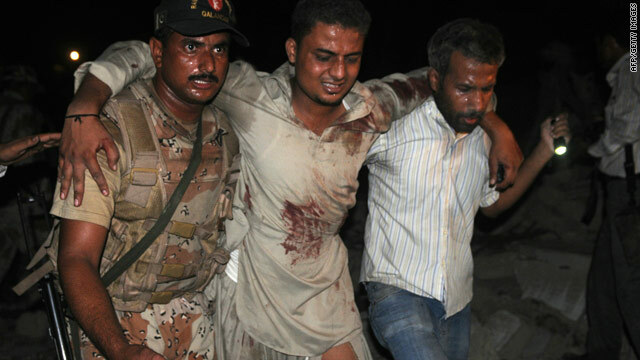 The number of wounded in the attack - which took place in the city of Karachi on Thursday - has also risen to 180, said police official Javed Hussain. Hussain said about 500 kg (1,100 lbs) of explosives was used in the attack. 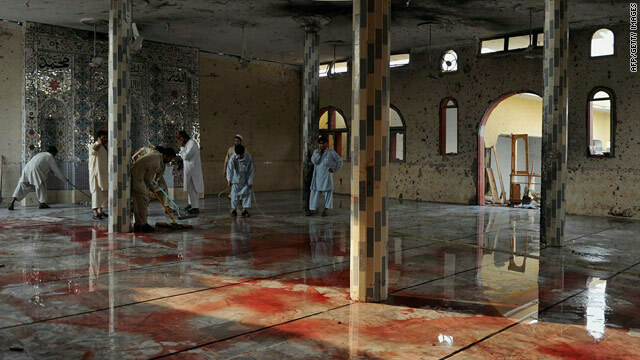 Pakistani Taliban spokesman Azam Tariq told CNN that the Taliban carried out the attack, which police say targeted building that housed a Crime Investigation Department facility. region, a strike that killed four people and injured 18 others. This follows a fatal blast that killed at least 67 people and wounded more than 80 others in a suicide attack that targeted anti-Taliban members at another mosque in the northwest, said government official Khalid Umarzai. Pakistani military officials and a local political official gave conflicting accounts Tuesday of attacks by Pakistani jet fighters targeting suspected militants in Pakistan's tribal region, with a politician saying at least some of the dead were civilians. Two military officials told CNN at least 30 suspected members of the militant group Lashkar-i-Islam were killed in the aerial attacks. The attacks targeted militant hideouts, illegal radio stations, training centers and several vehicles rigged for suicide attacks, the officials said. The attacks took place in three villages in the Tirah Valley region of Khyber, one of seven districts in Pakistan's tribal region. Gen. Hamid Gul, the former head of Pakistan's intelligence service who is mentioned numerous times in the WikiLeaks documents, called the accusations that Pakistan was secretly supporting al Qaeda lies. Once referred to as the "father of the Taliban," Gul worked with the CIA through the 1980s to fund and train the Afghan Jihad against the Soviets. Many of the Mujahedeen went on to govern Afghanistan as the Taliban. CNN's Reza Sayah sat down with Gul on Monday.